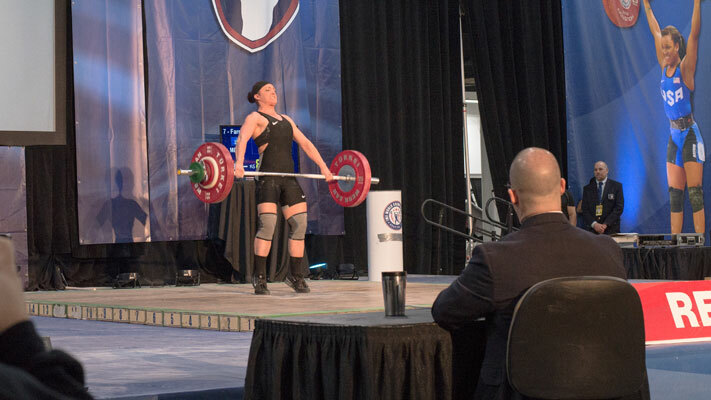 Nearly 400 competitors from across the U.S. traveled to Oaks, Pa., on February 19-21 to compete in the USA Weightlifting National Junior Championships & Senior Trials. Two goals were foremost in their minds: Show what they were made of in a high-profile competition, the first event cultivated by the newly formed Valley Forge Sports Commission. And qualify for the U.S. weightlifting team for the 2016 Olympic Games in Rio de Janeiro. Dane Miller, owner at Garage Strength in nearby Leesport, Berks County, was head of the local organizing committee, overseeing a crew of more than 30 volunteers while concurrently keeping track of his weightlifting team. As an onsite presence throughout the weekend, he had an up-close-and-personal view of how the event unfolded. "I thought the weekend went great," he commented. "Everything was awesome. Once everything gets rolling - people figure out how the schedule works, how to get to the warm-up room, where the food is - once everyone figures that out, it goes really well. And that&apos;s what this weekend was." 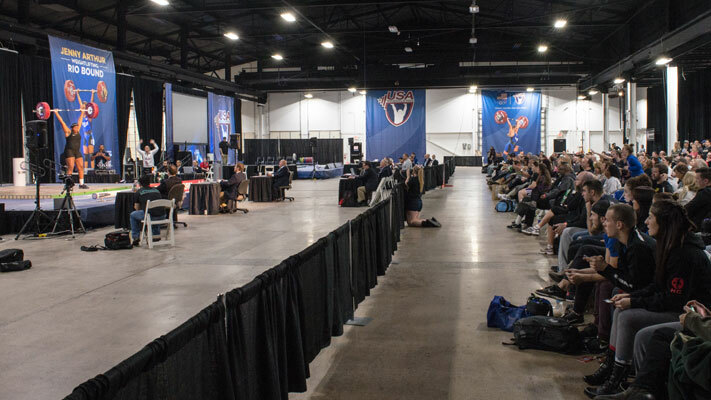 The 2015 championship was held in Oklahoma City, after which Valley Forge Sports convinced the organizers to come to Pennsylvania and vie for greatness at the Greater Philadelphia Expo Center. The change of location, according to Miller, had a positive effect on the competitors. "[This] was probably the best national event I&apos;ve ever been to," he said, "solely because of the size of the venue and how much space there was. "This edition of the Junior National Competition brought out the largest number of competitors we&apos;ve ever had. But the [Expo Center] was perfect because although there were way more attendees than last year, it didn&apos;t feel that way because of how open everything was. And I think that helped everything flow really smoothly. Especially in the back room and the warmup room, where people are going at it. It wasn&apos;t as clustered as it was last year," said Miller. The atmosphere, Miller states, propelled notable results. Two female lifters, Maddie Rogers and Morghan King, stand a very good chance of making the Olympic team, thanks to the strength and form exhibited in Oaks. "In the senior trials, Maddie and Morghan were going back and forth," Miller recalled. "Maddie Rogers came out at 6 for 6 and hit unbelievably good weight. She really put herself into position to go to the Olympics. And what&apos;s scary is that she&apos;s got another three months of training to go, to only get better. So it&apos;s on everybody else&apos;s plate now if they can come back and beat her. But I can only see her getting better." Morghan King&apos;s scores also bode well for her future, said Miller. He project that if her rising arc continues, her scores will "...pretty much put her into the driver&apos;s seat to go to the Olympics." The next milepost for both these women are the Olympic trials in May in Salt Lake City. Miller said the drama of watching Rogers and King vie against each other was fierce. "Morgan and Maddie both lifted very well," he recapped. "I thought the women were going to have a lot more misses than they did because of the pressure. But watching it, Maddie and Morghan didn&apos;t back down from each other. They went head-to-head in one of the most intense women&apos;s sessions I have ever watched. It was freaking awesome." Miller credited the efforts of the Valley Forge Sports crew for creating a setting where this type of head-to-head test could flourish. "The Maddie/Morghan challenge was the culmination of a really, really good weekend. Their scores showed how really well everything was being run. They both just came out, and there were no distractions, the atmosphere was good, the place was packed, everybody knew what was on the line. And they lifted like a trip to the Olympics was on the line, which it was." On the male side, things weren&apos;t quite as stellar. "We had some decent totals," Miller explained. "But I don&apos;t think they&apos;re going to be good enough for Rio." Throughout the course of the competition, nine records were broken: six by the guys, three by the women. In summation, Miller was asked if USA Weightlifting would consider a return to Montgomery County. "Absolutely yes," he responded. "The meet was awesome; the media side was great for all the camera guys, they had plenty of room. 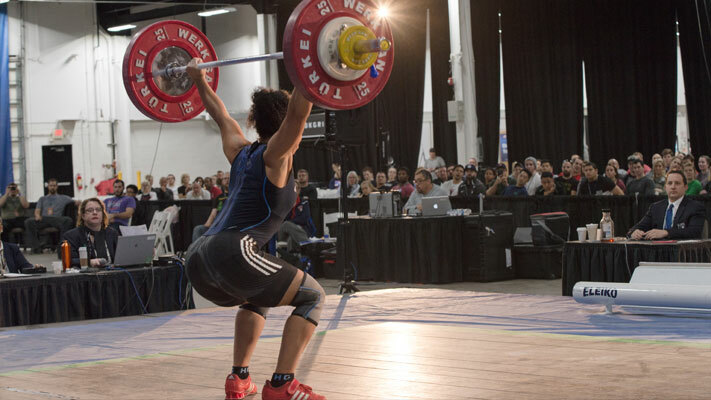 "USA Weightlifting always has these meets in the Midwest and the West Coast. But the East Coast is more populated. So they have it near Philadelphia, and the meet blows up. You&apos;ve got people driving from Maine, New Hampshire, Massachusetts, North Carolina, South Carolina, Georgia, Ohio, Kentucky. The popularity of the sport is getting bigger. So that helps improve attendance." Miller concluded: "I think that USA Weightlifting is doing a disservice to their members if they don&apos;t bring it back."